When you have logged into JustTLC you will meet the Start Page ( ) control view, where you e.g. create and maintain projects. It is shown below. 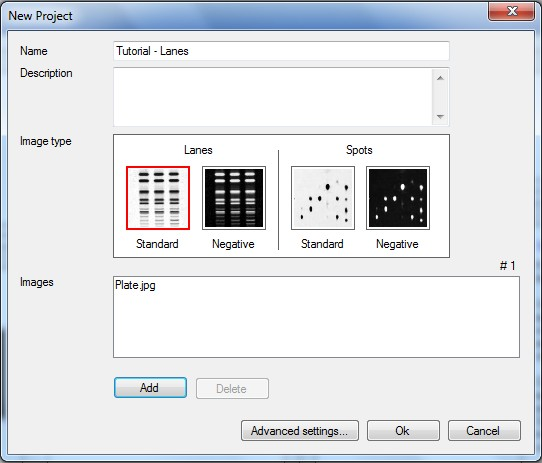 To create a new project click on the Lanes Standard project template in the Project Types panel. 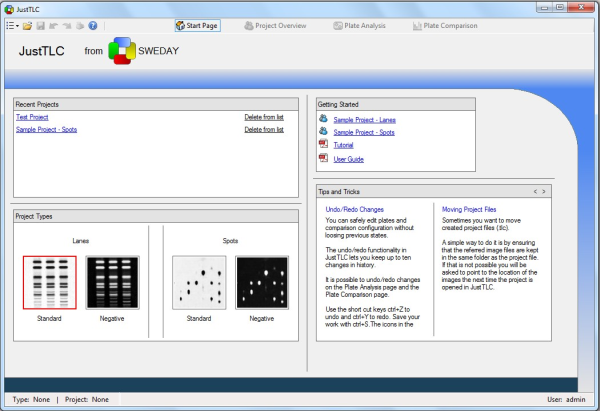 This will open the New Project dialog that you use to create your project. In the dialog enter a project name, e.g. "Tutorial - Lanes". Click on the Add button and browse to your downloaded images and click Ok after selecting image with lanes. Your New Project dialog should now look like the one below. Click on the Ok button and your have completed the creation of your project. When the project has been created you are redirected to the Project Overview ( ) control view. All the plates in the project are presented as thumbnail images together with some additional useful information about them.